Prior to the start of the 1998 Winter Olympics at Nagano, the World Powers in Ice Hockey were considered to be the USA, Canada, and Russia. Facing these daunting opponents the Czech Republic team adopted an unexpected defensive approach. The Czechs had only one big name player, their goalkeeper (pictured right), and they built their game plan around him. The strategy bamboozled their aggressive minded opponents. The Czech Republic took Gold. Two years later and we find the most successful player in the history of Chess, Gary Kasparov, surprisingly beaten by his former pupil Kramnik for the Championship of the World. Kasparov loses because he is unable to crack the solid and previously unheralded Berlin Defence of the Ruy Lopez. Interviews with Kramnik later reveal that his match strategy was influenced by the Czech Ice Hockey team. Yes, lateral thinking works in chess, and not just at the stratospheric level of Kramnik and Kasparov. There are some problems which cannot be solved easily without thinking laterally. Are you ready to use lateral thinking to improve your Chess ? "Lateral thinking is like the reverse gear in the car. One would never try to drive along in reverse gear the whole time. On the other hand, one needs to have it and to know how to use it for maneuverability and to get out of a blind alley." Your lateral thinking skills will complement the more conventional thinking methods, giving you that, much needed, secret edge to win more. Reading widely in areas apparently unrelated to Chess, is a good way to jump start your creativity. Strategic thinking can be developed by learning more about nature's predators, other sports and military strategy. Understanding human nature generally, through psychology and literature, as well as history, may also help tremendously. Study whatever areas interest you personally, and then spend time reflecting, on how the principles in your favourite areas, may apply to a Chess game. There is no limit to the connections you can make. Anything at all can be related back to chess. Bobby Fischer himself said "Chess is Life" and both Korchnoi and Karpov had books with similar titles also. Use your life lessons in your chess game. Make your personality flourish on the board. How do you approach the game? For some Chess is the Martial Art of the Mind. (Grandmaster Maurice Ashley admits to using his knowledge of Aikido and Energy on the chess board also.) Some see it as a science, some as a sport, some like Lasker, view Chess as a fight. "Chess is a Language," say some fluent players. Realize that your outlook will affect how you play the game and find the approach that works best for you. Try on different approaches. Bent Larsen viewed chess as, "a beautiful mistress." This lateral (or some may say horizontal) thinking no doubt helped his enjoyment of the game tremendously. "Predators, which I personally enjoyed learning about, include the Jellyfish and the Crocodile, their methods can also be applied to chess." Next time you need to beat a player, to get more rating points, think of yourself as a predator, looking for lunch, and see what ideas come to you. 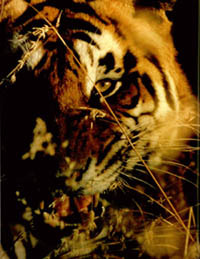 That's what Simon Webb did in his excellent book "Chess for Tigers." Predators, which I personally enjoyed learning about, include the Jellyfish and the Crocodile, their methods can also be applied to chess. Tune in to the Discovery channel and watch the Super Nature series. "Chess for Tigers" is basically a chess version of the classic "Book of Five Rings" written by the legendary swordsman Musashi. The basic premise of both books is Know Yourself, Know your Opponent, Use Prevailing conditions to your advantage and have relentless dedication to constantly improve. "The Art of War" by Sun Tzu is another example of this philosophy. All three of these books will help develop your lateral thinking in a strategic way. While some gain insight from the dominating methods of Machiavelli and Bismarck in political history, others use literature to develop their chess. Jonathan Rowson's book on the "Seven Deadly Sins of Chess" is replete with literary references. Mark Dvoretsky, the leading chess trainer of Russia, quotes readily from classical literature, and also from famous chess players, in his profound books. Perhaps it is their broad educational system, and knowledge of history, that has been the real source of the Soviet success in Chess. If you don't know who Nabakov is then at least play some Bob Marley music and remember that, "If you know your history, then you would know where you're coming from." The January 2002 issue of Chess Life has the following example of lateral thinking in Chess. After a game in which a lone knight holds off two black passed pawns, allowing white time to promote his own pawns and win narrowly, the winner, Miles Kinney, said he got the idea from the historical story of Horatius. Apparently, the heroics of the Roman senator, who lost his own life while single handedly delaying an enemy advance against the only bridge into Rome, had inspired his winning strategy.